A couple of rather interesting, albeit pretty low-quality shots have surfaced online. They are said to come from Entel - Chile's largest carrier and seem to show two upcoming Motorola devices. One is the Moto G (2015) or 3rd gen. The legendary budget handset has come a long way since the original came out in 2013 and the latest iteration promises to pack even more Android goodness and productivity without breaking the bank. The headset was already spotted in a few live photos and a video back in June, so, we have a pretty good idea what to expect. This new leak confirms a lot of this initial information. The Moto G (3rd gen) bears a lot of visual resemblance to the current second generation and has also kept the 5.0-inch display size and most-probably the 720p resolution as well. As far as we currently know, the CPU is also upgraded to a quad-core unit, running at 1.4GHz, most-probably the Qualcomm Snapdragon 410. RAM should be set at 1GB and 8GB for onboard storage. Thankfully, there is a microSD card slot and judging from previous Moto G models, other storage variants as well as a dual-SIM variety should follow shortly. The camera setup is also bumped up quite a bit with a 13MP shooter on the back, dual-LED flash and a 5MP one on the front. The other phone featured in the leaked photos looks to be a rugged Moto X variant. 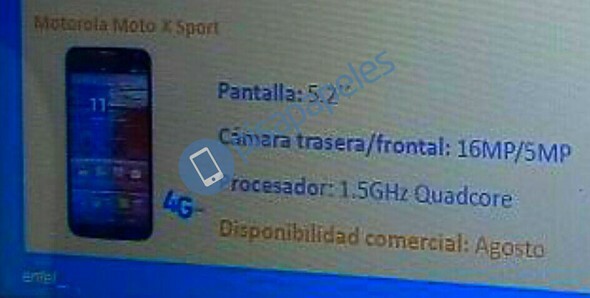 The title leads us to believe that it is dubbed the Moto X Sport. The headset is equipped with a 5.2-inch screen, just like the current Moto X, but perhaps with some extra protection, which we can't really tell from the photo. The rest of the specs sheet includes a 16MP main camera and a 5MP selfie one, which is an upgrade over the current Moto X. We do also have some info on the chipset - mainly that it is a quad-core chip, running at 1.5 GHz, but a make and model is not mentioned. Last, but not least, the leak leads us to believe that both models will be unveiled in August, which is just a few weeks away, so, prepare for a new batch of Motorola goodies shortly.